Front Façade of the Renwick Gallery. The major renovation of The Renwick Gallery of the Smithsonian American Art Museum preserves and respects the historic character and building envelope of the National Historic Landmark building, while modernizing infrastructure and systems with state-of-the-art sustainable and energy-efficient technologies. The renovation also included restoration of many of the building's historic details and installation of new blast-resistant windows. Project Completion Date / Date Building Occupied: Smithsonian Institution took over the building in July 2015 and the project was open to the public in November 2015. The $30 million major renovation of The Renwick Gallery of the Smithsonian American Art Museum preserves and respects the historic character and building envelope of the National Historic Landmark, while modernizing infrastructure with state-of-the-art sustainable and energy-efficient technologies. 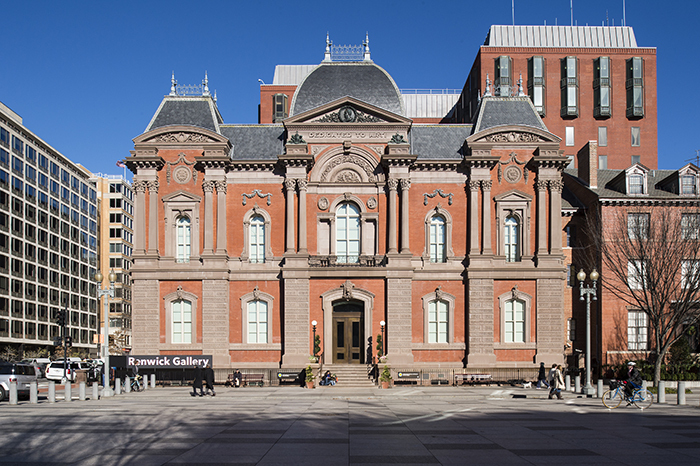 The 34,000 SF Renwick Gallery, situated across from the White House and built in 1859 to the design of architect James Renwick, Jr. as the original Corcoran Gallery of Art, is a principal structure in the Smithsonian Institution portfolio and the first purpose-built art museum in America. Main Elevation. Built in 1859 by architect James Renwick, Jr. as the original Corcoran Gallery of Art, the building occupies a prominent site at the intersection of Pennsylvania Avenue and 17th St. NW, only a block West of the White House and directly adjacent to the Blair House. The structure was last renovated in 1967–1972, when it was restored as an art gallery after decades of serving other purposes. Since that major renovation, when the building's first modern systems were installed, numerous incremental improvements had been made, including exterior masonry repair and restoration, interior exhibit gallery improvements, and other infrastructure repairs. However, most of the existing building systems dating to the renovation in 1967–72 had reached or surpassed their useful service, and were difficult to access for maintenance and repair. Exterior Façade Details After Renovation. Masonry was restored and 34 individually engineered and customized blast-resistant windows were installed to match the original 1860s aesthetic. Rather than relying on rote historic preservation, the design employs an artful interpretation balancing heavy infrastructure improvements with a light architectural touch, executed with care to ensure the building continues to be an asset for the nation for years to come. The historic features are not impacted—only enhanced with modern, high-efficiency, and cost-effective infrastructure systems. Once considered a "hidden gem," the newly reopened space has become a popular destination, having exceeded previous annual visitation averages within six weeks of reopening. Octagon Room to Grand Stair Hall prior to renovation. Octagon Room to Grand Stair Hall after renovation, showing updated palette and gilding reflecting a contemporary interpretation of historic precedent. First floor corridor of the Renwick Gallery. Major building modernization that ensures the institution's sustainability for another 50 years, through innovative programming, use of technology, and respect for the history of the building. Secure/Safe Goal: Upgrade building systems for improved perimeter blast resistance, on-site monitoring, and fire/life safety measures meeting today's codes, including increased egress capacity. Sustainable Goal: Upgrade building components to achieve a LEED-NC Silver rating, a 50% reduction in energy use, a 35% reduction in potable water use, and achieve a 50–year overall life cycle before needing major renovations. Functional Goal: Upgrade building components to support a range of innovative exhibit programming with additional electrical, technological, and structural capacity. Approach should minimize the need for major changes over a 50–year life cycle. Integrating the New with the Old. New structural steel, fire protection piping, and electrical conduit threaded with surgical precision through the same plane as the original historic timbers throughout the attic. Photo by Prakash Patel; Courtesy of Consigli Construction, Co., Inc. Accessible Goal: Improve access not only for the visiting public, but for those who are stewards of the building systems and their upkeep. All equipment should be readily accessible for maintenance. Elevator access is available to all levels. Aesthetic Goal: Modernization should not have any impact on the original geometric proportions of either the exterior building mass or the interior spaces, while providing an updated neutral finish palate flexible with a variety of exhibit types. Grand stair prior to renovation. Cost-Effective Goal: Meet the target overall renovation budget of $30M, including all soft costs. Historic Preservation Goal: Stabilize the historic structure to allow a 50–year renewed life cycle, while restoring previously lost details, including windows, vaulted ceilings on the second floor, and molding details. Productive Goal: Support a four-fold increase in visitor attendance while meeting the Smithsonian Institution's environmental criteria. Other Significant Aspects of the Project: Use modern technology to enhance the renovation process, for increased construction efficiency, best value, and efficient building operations. The project team utilized whole building energy simulation tools, as well as the NIST BLCC tool to study life-cycle costs with system choices. The team also utilized lighting simulation software to determine the efficacy of lighting approaches particularly in the basement, which has a low overall head height and significant overhead infrastructure. The team was able to utilize laser scanning to shape a comprehensive coordination model developed to a Level 400 level of definition. Tablets were used during construction to record field issues and track resolution. A 50–year overall life cycle, before another major renovation, was targeted. In addition to the high-performance design principles from the Whole Building Design Guide, the LEED rating system was also used as a framework for tracking integrated design and construction measures. The team's success was evaluated on the ability to meet the project budget and schedule, while meeting the goals set forth in the Owner's Program Requirements, which was developed in the first 60 days of the project and continually refined. Left to right: First Floor Plan, Second Floor Plan, and Basement Level Plan. The primary success of the project was through the use of an integrated design process. The integration of MEP engineering directly within WRL's architectural team allowed challenging spatial and historic preservation constraints to be addressed from the very beginning of the project. The structure created by the Smithsonian's processes was beneficial, as it allowed for predictability of documentation expectations and an orderly way to capture change in a transparent way. The Smithsonian also selected a general contractor with a significant amount of experience working on historic buildings. The collective team had a deep appreciation for the "why" of the project, rather than just the "how" of the project. The design team worked closely with the owner team to gather existing building documentation through interviews, on-site survey, and review of historical records dating back to the mid-1800s. This also included operational benchmarking, including visitation, energy and water use, and exhibit requirements. The design team benefitted from having six official design submissions, each having their own review processes. This allowed all stakeholders sufficient opportunity for design input. Cost estimating and energy analysis were also rigorously used in all of these phases to ensure a right-sized approach to design. The team broke apart the Smithsonian's design standards and provided feedback on every element through the lens of operations, cost, and resource impact. The general contractor (GC) utilized several innovative practices to reduce risk, including laser scanning, 4D Building Information Modeling (spatial + time), lean management practices, and tablet-based field reporting and resolution tracking. The GC worked closely with a significant number of external agencies with the design team's support, including the Secret Service, National Park Service, Department of State, General Services Administration, DC Department of Public Works and Transportation, Utility Companies, the Commission for Fine Arts, and the National Capital Planning Commission. Exterior - Scaffolding and protective screening measures taken during construction. The design team worked closely with the facility operations team from as early as concept design. This feedback shaped system selection. The design team continued its engagement with the operations team during construction and commissioning, to ensure full understanding of design intent to allow optimized performance. The design team will work with the Owner team through 2017 (2–year period) to track building performance. Design Software: Autodesk Autocad and Revit, Trimble Sketchup—for documentation and visualization of design solutions. Photo-realistic rendering. Energy Simulation Software: Trane Trace 700—for heating and cooling load evaluation, and whole building energy simulation. Benchmarking Software / Methodology: ENERGY STAR Portfolio Manager. The design team worked with pre-renovation energy, water, and environmental data to set project targets within the context of the Architecture 2030 challenge and the Smithsonian's own sustainability framework, which was shaped by Executive Order 13514 for Federal Sustainability Leadership. Other Tools: AGI-32 lighting evaluation tool—used to review the combined impact of electric and natural daylighting. Building Information Modeling (BIM) tools the Project Utilized. List which ones and explain how they benefited the project. The project used laser scanning and Building Information Modeling for careful coordination of building systems within existing spatial constraints. The team developed a detailed 3–D model of all building systems, after importing detailed laser scanned point cloud data. Subcontractor models are color-coded and identified by trade. Architectural and structural models are semi-transparent. This process allowed for final integration of systems with a dimensional fidelity not previously possible. Virtual modeling was critical to allowing clash detection of art with building systems, as it moved through the basement from the building entrance to the workshop. Building systems and materials were evaluated through the lens of all of the topics in a balanced manner. Rather than just looking for the overlap of positive characteristics within a traditional Venn diagram, the team looked at ways to achieve all, without compromise. The best example of this approach relates to the integration of attic air-handling unit (AHU) equipment. A previous master plan for the building called for the roof of the building to be raised by 10 feet, to accommodate systems. The design team took a fresh look at this challenge and developed a scheme that required absolutely no change in building mass. This was accomplished through multi-disciplinary collaboration. Building cooling and heating demands were reducedthrough enclosure and lighting upgrades, selected modular AHU equipment, and better utilized building volumes for VAV boxes. The result was cost-effective; supported the historic preservation brief; allowed the building's aesthetic to be maintained; had no impact on usable program area; increased access for maintenance; and allowed for an overall 50% reduction in energy use. A specialized retractable temporary canopy allowed more flexibility in movement of materials into the building and kept the building weathertight through the winter months while allowing easy access to the roof opening during the renovation. This area was the future location of the main attic mechanical room. The bow trusses were removed carefully for future installation as an artifact within another Smithsonian facility. The renovation utilizes energy-efficient LED exhibit lighting (developed by the design team, the museum's in-house lighting designer and an LED manufacturer); higher-efficiency fluorescent sources with daylight and occupancy controls for back-of-house spaces, replaces and improves major building infrastructure systems, and significantly improves equipment access allowing easier long-term maintenance critical to maintaining consistent energy and water use performance. The new lighting system generated a 70% reduction in lighting power density, which, combined with other improvements, significantly reduces the environmental footprint. In an initial 12 months of operation, energy use intensity (EUI) is +/- 50% less than before renovation, even with significant attendance increase. The renovation addressed several indoor environment-related issues, including occupant comfort within a conservation environment. Ventilation air delivery meets ASHRAE Standard 62.1–2010 with a high level of control and monitoring. High-efficiency particulate filtration is provided at each central station air-handling unit and further monitoring is provided with space carbon dioxide sensors. Air-distribution effectiveness and system level ventilation effectiveness were both accounted for. The project has documented all low-emitting material credits under the LEED for New Construction program. ASHRAE Standard 55 was used as a reference standard for thermal comfort design evaluation. Activity levels (met = 1.0 to 1.5), clothing insulation levels (clo = 0.5 or 1.0), air velocities (40 fpm target), space air temperature (70°F to 74°F typical range), radiant temperature (within 5°F of ambient), and condensation control were carefully considered. Prior to the renovation, the museum encountered issues with surface condensation, due to a lack of air movement and stable supply air dew-point control. Mechanical, Electrical, Plumbing and Fire Protection Coordination Model. The contractor worked closely with subcontractors and the design team to develop a detailed 3-D model of all building systems, after importing detailed laser scanned point cloud data. Subcontractor models are color-coded and identified by trade. Architectural and structural models are semi-transparent. This process allowed for final integration of systems with a dimensional fidelity not previously possible. 3D Coordination Model. Courtesy of Consigli Construction, Co., Inc. The Renwick Gallery was the first purpose-built art museum in the United States. Ensuring its sustainability for another 50 years is in itself important to the resilience of the cultural arts community. The project was listed on the National Register of Historic Places in 1969 and is considered one of the first buildings of the modern historic preservation movement. By 2035, the majority of building stock in the United States will be renovated; these types of projects show what can be done, with the most challenging of building types. Accessible: The main accessible entrance of the building was improved with new lighting, embedded snow melt, signage, and security measures. The procession from the accessible entrance into the gallery levels is also improved for greater dignity. For building staff, all building systems are provided with manufacturer required clearances. Aesthetics: There were no major changes to the building mass. Interior finishes were refreshed with a neutral color palate, suitable for use with a wide range of exhibit types. Windows were replaced with more authentic profiles, while also meeting modern UV, light, security, and thermal requirements. Cost-Effective: The project was delivered on-time and on-budget. The project was funded through a 50–50 Public/Private Partnership. Fundraising was completed early during the construction phase with significant support by the philanthropic community that recognized the importance of this renovation to the national arts community. Functional / Operational: The building systems can now support a wide range of exhibits with greater HVAC, electrical, and structural load capacity and flexibility. All building systems can be maintained more easily than before. Most equipment, prior to renovation, was difficult to access or located in areas that created unnecessary collection risk. Historic Preservation: The project reversed the negative impact of prior renovations, while providing a strong backbone for future operations. Even as components of equipment have to be replaced over the next 100 years, it is not expected to be as challenging, as items can be moved in and out of the building more easily and safely. Productive: Unlike a traditional office building, the product of this facility is the ability to show art exhibits with the highest level of uptime as possible. In the first quarter of operation, the Renwick Gallery exceeded pre-renovation annual attendance values. The building is now on its second exhibit fit-out since late 2015. The building is also home to several full-time staff—the modernization resulted in no net loss of usable program, while at the same time improving indoor environmental quality. Secure / Safe: The building incorporates modern life-safety systems. An entirely new egress stair was threaded through the East building core. Building partitions and air movement systems now incorporate appropriate protective ratings and devices. Windows meet the GSA's blast criteria for public facilities. Sustainable: The project is on track for achieving LEED-NC (v3) Silver Certification. In the first 12 months of operation, the building has operated at an EUI of approximately 100 kBTU/yr-gsf, 50% than the 2012 pre-renovation condition. Over 90% of the building structure was reused. Lighting power for exhibit spaces was reduced by 80%. An HVAC condensate reclamation system offsets 35% of cooling tower make-up water needs. Main Attic Mechanical Room after restoration. Careful placement of equipment allowed the team to avoid changing the form of the building, while accommodating a new boiler plant, air-handling units, and facility storage. Pre-Renovation Condition—Air-Handling Unit. Prior to the renovation, equipment was generally difficult to access and challenging to maintain. Core museum staff engagement: The design team engaged a broad constituency of stakeholders to ensure timely project delivery, on budget, and with sufficient flexibility to support a wide range of exhibits in the future. Included in this initiative was deep collaboration with external review agencies in Washington DC, to minimize the external impact of changes to the appearance of the building. Weekly meetings, augmented by a formal electronic review process, were utilized. Facility management staff engagement: The design team worked closely with institution-wide facility managers, as well as the day-to-day operations staff, to understand system concerns, review energy and water use consumption predictions, and ensure adequate provisions for long-term maintenance. Meetings occurred at major design phase submission milestones, as well as regularly during the construction and post-construction process. Lighting design engagement: The design team worked closely with Scott Rosenfeld, the Smithsonian's staff lighting designer, to develop a flexible and efficient LED lighting scheme. The team further worked with several LED lighting manufacturers, which led to development of a new type of LED source specifically for the specialized needs of the Renwick (narrow-spot, high-throw). The source is now being sold for use in other markets, such as hospitality and retail. Meetings included joint visits to manufacturers, review of precedents at other institutions, and meetings with other discipline leaders. Positive and Negative Aspects of the Process, Including the Composition of the Project Team that Allowed Goals to be Met. The only primary challenge of the project has been with the building chiller plant. Components of the chiller plant were installed in a replacement project prior to the major modernization. The vendor has had very poor performance on the project, with slow, incomplete, and inconsistent responses to design, construction, and operations feedback. This is one of the biggest challenges that faces the building industry. One can select a high-performance team, but because of how products are procured, there can end up being a lack of consistent engagement from a vendor. In significant contrast, the manufacturer of the LED lighting was excellent to work with. They invested additional time in research and development, to create a product that met a whole series of demanding attributes: cost, color stability, lumen output, luminous efficacy, beam control, and flexibility. The manufacturer realized that strong performance would allow for future benefits, including, the ability to use the product in the retail and hospitality sectors. How Building Materials, Systems and Product Selection Addressed the Design Objectives, Goals and Strategies. Any decision-making was performed using multi-attribute evaluation. Those attributes align closely with the attributes supported by NIBS for the whole-building design process. The existing site was very constrained, with very little staging area. The contractor planned carefully and developed a retractable temporary roof system, to allow more flexibility with load-in of building materials. From a design perspective, because the mass of the building was not changed, there was very little concern from the community with the longer term impact of the modernization. Efficient systems allowed for smaller systems that allowed for reduced architectural scope. This in turn allowed the project schedule and budget to be maintained. This was accomplished in three ways: visitation, resource use (water/energy), and overall uptime. Uptime is based on factors such as power reliability, environmental control reliability, equipment redundancy, and periodic maintenance. The Renwick Gallery renovation supports the museum's mission: "The Smithsonian American Art Museum is dedicated to collecting, understanding, and enjoying American art. The Museum celebrates the extraordinary creativity of artists whose works reflect the American experience and global connections." In collecting, the replacement of the building's mechanical systems and upgrades to fire, safety, and security provide for a safe, secure, climate-controlled environment for display of valuable artworks. New windows and a new roof ensure that the building's envelope is tight and environmentally appropriate for artworks. In fostering understanding, office and collection storage areas were reconfigured for more efficient staff use for research and study of collections. The updated, contemporary look of the spaces provides inviting gallery space for enjoying the collections and exhibitions organized by the Renwick. All elements were pulled together in the opening exhibition WONDER, a celebration of the extraordinary creativity of nine contemporary American artists. Wonder Exhibit Installation Plexus A1, by Gabriel Dawe, 2015, uses colored thread to simulate "rays of light". Wonder Exhibit Installation Shindig, by Patrick Dougherty, 2015, uses sticks to weave a unique structure. After opening, the Renwick Gallery quickly exceeded its previous annual visitation average, and saw more than 500,000 visitors and nearly 180 million social media impressions in its first six months. The reopening has engaged new audiences, especially millennials and young professionals, as reflected in increased social media activity. Once considered a "hidden gem," the newly reopened space has become a true destination for art lovers and visitors across all demographics who are passionately excited about its exhibitions, its history, and its importance for Washington, DC and the nation. The Renwick was named "Best Art Gallery" of the year in a Washington City Paper reader poll, one of DC's "10 Best Attractions" by USA Today, and one of the "Ultimate 25 Things to Do in DC" by Fodor's Travel alongside icons such as the White House and Kennedy Center. Visitor and Community Response as Gauged through Social Media. The Renwick Gallery has had more than 240 million impressions on Twitter and Instagram this year. #RenwickGallery was widely used with reposts to a variety of social media platforms. Signs stating "Photography Encouraged" were located throughout the building. With the nine immersive and photogenic installations from the opening exhibition WONDER, the museum became known as a "selfie heaven" and was declared "most Instagrammable location" by the Washington Post and Brightest Young Things. Think pieces in The Atlantic, The Washington Post, Washingtonian magazine, and Washington City Paper used the Renwick as a case study for the success of social media in museums. Grand Stair Hall, second floor. The project team spent a significant amount of time coordinating installations to accommodate structural, electrical, technology, HVAC, and life-safety considerations. Visitors encounter this Installation, Volume (Renwick) by Leo Villareal, 2015, a light sculpture featuring thousands of LEDs programmed to dim in an infinitely dynamic pattern. Long lines out the door on holidays and weekends provided the visible evidence that the new Renwick struck a positive chord with its visitors. The museum hired line managers to facilitate the crowds and, despite having to wait in line, visitors were excited, energized, and positive about their experiences at the Renwick. "The very best thing that has happened in DC for a very long time!" "So fun and vibrant. Thank you for the shock of fresh, creative energy just blocks from the government." "It's the best incarnation of the Renwick I ever could have imagined!" "This is the most fun I've had in any museum in 69 years! Who knew art could be so participatory!" "Filled with wonder—first time here. Cannot wait to become a frequent visitor." "A wonderful experience full of imagination and adventure." The Diamondback commented "If you spend just one hour in Washington this season, for the love of art, spend it at the Renwick Gallery." Grand Salon prior to renovation. This space was last renovated in 2000 and featured paintings hung "salon-style." The space continues to be one of the best public spaces in the Smithsonian portfolio for lectures and chamber music and is also used for evening events. Grand Salon after renovation 1.8, Renwick, by Janet Echelman, 2015, part of the Renwick Gallery's "Wonder" exhibit. This installation is intended to capture the power of the Japanese earthquake that occurred on March 11, 2011. The event was so powerful; it impacted the length of the day by 1.8 milliseconds. ArchitectureDC, G. Martin Moeller, Jr., Assoc. AIA, Fall 2016. High Performing Buildings, Roger Chang, August 2016. Architectural Lighting, Elizabeth Donoff, May/June 2016. Washingtonian, Hillary Kelly, February 5, 2016. Interior Design, Jesse Dorris, December 2, 2015. National Trust for Historic Preservation, Katharine Keane, December 1, 2015. The Plain Dealer, Steven Litt, November 22, 2015. Architect, Deane Madsen, November 13, 2015. The New York Times, Graham Bowley, November 12, 2015. The Washington Post, Kennicott, November 12, 2015. Washington Business Journal, Rebecca Cooper, November 10, 2015. Architectural Record, Katherine Boyle, February 19, 2013.